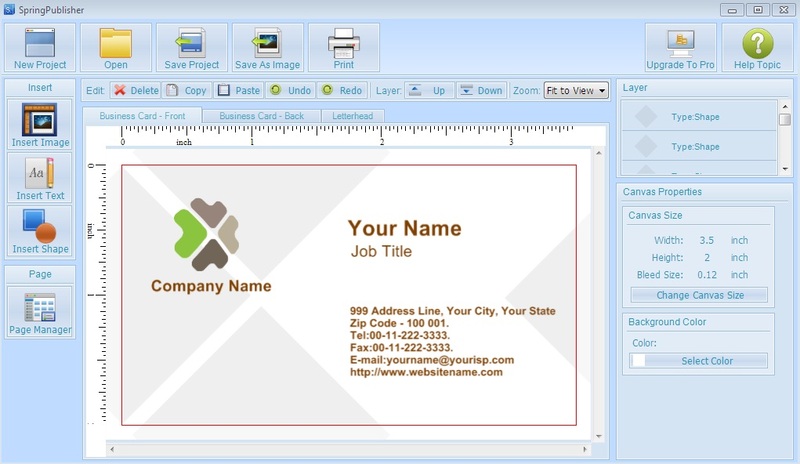 People who find difficulty in making there business cards, Flyer, Post cards and letterhead designs should know about a awesome software called as Spring Publisher. Spring Publisher is a designer which is very user friendly and easy to use. This is a professional designer which can be used daily for desktop publishing. Spring Publisher has got many templates and online template store. You can find a powerful multi-layer editor which is very flexible. Also detailed help files which enables you to design and print Business Card, Flyer, Postcard, Letterhead and other artworks within a few minutes. You can be able to add images, texts, vector shapes, logos and arrange them as you like. You can use various image effect like shadows, opacity, rotation, and etc. You can download high quality templates from the template store any time. You can make your artworks to print either directly with your own printer or in professional print shops with the awesome clarity. You can make high resolution artwork with a maximum output of 350dpi. The Spring Publisher Pro costs 24$. So how about getting it for free ? If you want to get this license key for free, here is your chance. We have 6 Spring Publisher Pro Keys with us and we don’t mind giving all of them. So if you want to get into this giveaway, Just share the post on your facebook account and paste the link here. We will announce the winners on Monday (i.e) 25th of July 2011. Hope you all will like this giveaway. Great program, thank you for this outstanding offer! Great program, worth the fight. This is really an excellent software. Thanks for this! This is so cool and very useful indeed! A great contest, thank you for grat software and nice giveaway! Thank you for your license! Thank you for your interesting page! THANKS!!! Thank you for the giveaway and license for Spring Publisher Pro.